Check out these basic tips on how to care for your contact lenses. By following these simple instructions you will avoid painful eye conditions. Beginning in childhood, it’s important for people to have regular vision checkups at the eye doctor in order to monitor the overall health of their eyes. In addition to that, some people like to conduct easy vision tests at home. For instance, a parent may give a five year old a simple vision test in order to get an idea of how well the child sees. In short, the results of a home vision test can reveal a few facts about the general condition of someone’s vision. The following outlines the materials that are needed for a home vision test as well as what is involved in the process. The first item needed for a home vision test is an eye chart. The traditional Snellen eye chart is one that can be used to test adults and children who can read. Alternatively, there is an eye chart called the ‘Tumbling E’ that is often used to test children who haven’t learned all of the letters of the alphabet. Once the eye chart has been chosen, the tester needs tape to secure the chart to a wall. Other necessary items include a tape measure, a paper cup, pen, paper, and a flashlight. The test needs to be given in a well-lit room that allows a person to stand 20 feet away from the eye chart. Once all of the materials have been gathered, a tester may begin to set up the area. First, the tester must use the tape to secure the eye chart to a plain wall without windows. Using the tape measure, the tester marks a spot on the floor that is exactly twenty feet in front of the Snellen eye chart. Whether the person is standing or sitting, the position of the eye chart should be at his or her eye level. After checking over the area, the vision test can begin. The person being tested sits on a chair or stands at the mark that is twenty feet away from the eye chart. Next, the individual places the paper cup over his or her right eye and begins to read the top line of the chart with the left eye. Moving from left to right on the eye chart, the person continues to read each line of letters. The flashlight may be used by the tester to point to the next letter for the person to read. When the person comes to last letter that he or she is able to see, the tester makes a note of the corresponding line number. The person then moves the plastic cup over his or her left eye and repeats the process. Once again, the tester makes a note of the row number next to the last successfully identified letter. The vision test procedure is essentially the same with the ‘Tumbling E’ eye chart except that the tester must take a little time to explain the test to any young child who is taking it. The tester must show the child that the Es on the eye chart are facing different directions. Furthermore, the tester must show the child how to point in the direction of the three horizontal lines of each E. It’s a wise idea for another adult to make sure that the child is covering up his or her eye completely during the test. The tester can then begin by pointing to the Es in each row. The results of a vision test are related to distance and the row numbers of an eye chart. 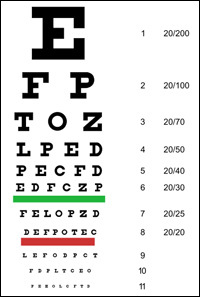 For instance, if a person has 20/40 vision it means that at a distance of 20 feet away the person can correctly read row 40 on a vision chart. Normal vision for three to four year olds is 20/40. The normal vision rate for adults is 20/20. As noted before, if a home vision test presents any concerns regarding someone’s vision, then an appointment should be made with an eye doctor for further assistance. Finally, a vision test given at home can be an effective way to prepare a child for his or her first trip to the eye doctor. With the help of a home vision test, a parent is able to explain facts about the test to the child as well as what the eye doctor does during an appointment. Chances are, a child who has taken a vision test at home will be more at ease for his or her first appointment at the eye doctor’s office.